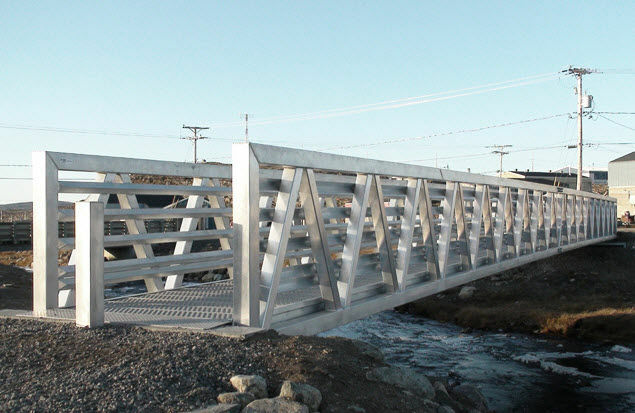 The 18-meter-long aluminum prefabricated pedestrian bridge link two areas of Quaqtaq divided by a river crossing the town; the footbridge safely connects homes and a church to Quaqtaqs nursing and medical center. This pony-truss bridge was spliced and packed into two coupled sections, loaded onto barges aboard a cargo ship, then unloaded on the beach and moved across town using a community loader, where the bridge was assembled and installed on-site. This 18M (60-foot) bridge weighs 1800kg (4,000 lbs.) with a live load deflection less than 36mm, with overall load capacity of 4.0 kilo Pascal (85 pounds per square foot), according to Canadian bridge code. 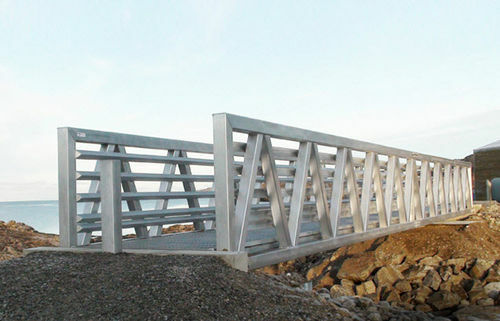 Establishing better access in Quaqtaq with our aluminum pedestrian bridges enables residents and visitors to utilize and connect to essential village institutions and services, without the high maintenance costs typically associated with steel bridge structures. Our aluminum footbridge design will serve Quaqtaq well for many decades, virtually maintenance-free. MAADI Group is committed to delivering modern bridges made from sustainable and recyclable aluminum that are transforming pedestrian bridge infrastructure throughout North America and around the world, says MAADIs President.